Protesters from the "yellow vest" movement hit the streets in France for the fifth straight Saturday, but the number of demonstrators was significantly smaller than in previous weekends. There were 33,500 protesters in France -- and 2,200 in Paris -- as of Saturday afternoon, a spokesperson for the Interior minister told ABC News. At the same time last Saturday, they were 77,000 total across the whole country and 10,000 in its capital. Police fired small amounts of tear gas to disperse groups of protesters near the famous Champs Elysees Avenue but the demonstrations are mostly peaceful. That pales in comparison to past weekends, when hundreds of angry protesters, many of them wearing gas masks or ski goggles, threw rocks and projectiles toward French police in Paris. In turn, police dispersed crowds by firing tear gas and blasting water cannons. Footage from last weekend's demonstrations showed protesters using plywood and other material to make barricades on various streets throughout central Paris. Demonstrators also set multiple cars on fire, broke store windows before looting them. The demonstration in France this Saturday comes after French president Emmanuel Macron addressed the nation in a recorded TV speech earlier this week and announced new economic measures in response to weeks of violent protests across the country. The 40-year-old head of state confessed on Monday that the anger of protesters was "deep, and some of their claims legitimate." Speaking again during a press conference in Brussels during a European Union summit on Friday, the French president said "our country needs calm." "It needs order. It needs to function normally again," he said. 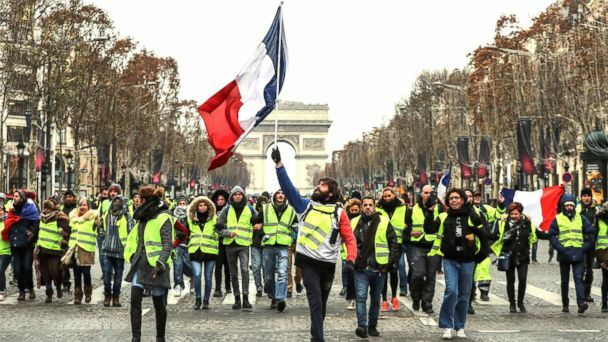 These protests are part of the "yellow vest" movement, named after the neon yellow security vests demonstrators have been wearing -- vests all motorists are lawfully required to have in their vehicles. These demonstrations started in small urban centers and rural areas of the country in response to a proposed fuel price hike, and demonstrators have been blocking roads over the past five weeks. French Prime Minister Edouard Philippe announced last week that he was backing down from the proposed fuel price hike. However, the protests have continued and turned into a broader rebuke against the economic policies of Macron and the French ruling class, which many citizens view as elitist and indifferent to their struggles.